A documentary on Adam Bork, co-creator of Food Shark. In this film, Adam shares of bit of his life as a car collector, vintage electronics buff and partner to his wife, Krista, who is the culinary genius behind their food truck business, Food Shark. 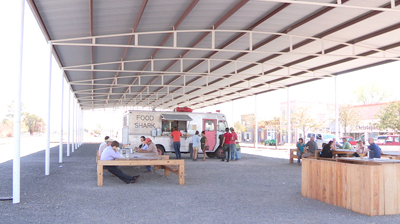 A community centered endeavor, Food Shark has become a tourist destination and hub within Marfa, a small diverse town in rural West Texas. This two-week HD workshop runs twice a year in Marfa, Texas and is designed for those who want to learn documentary filmmaking top to bottom in an intensive setting. Click HERE to learn how you can make a documentary in Marfa, Texas with Barefoot Workshops. Marfa Public Radio, Canon USA, Sennheiser, Bogen Imaging, Manfrotto, Lowepro, GoPro, Lowel Lighting, Anton Bauer & Inqsribe.